It has been beautiful all week in the Dry Tortugas. Clear skies with temperatures in the low 70's made it perfect birding weather and kept the Dry Tortugas Ferry busy all week bringing newcomers, as well as veteran birders to our little paradise. On our first day of bird watching, we got lucky and saw two female Red-breasted Mergansers swimming and paddling around in a very visible area of Fort Jefferson. They were pretty easy to spot with their large, thin orangish-red bill and shaggy crest on the back of their head. After watching these guys for awhile, we saw one of them dive underwater to catch a fish. These beautiful birds entertained our crowd for quite some time, and while it can be hard to track them with a lens as they move extremely fast, the photo sessions were in high gear. This Red-breasted Merganser became our favorite bird of the week, which is actually a large diving duck usually found in large rivers, lakes, and the ocean, preferring salt water over other species of merganser. This duck winters farther south and breeds farther north than the other American Mergansers. Breeding in areas across northern Canada to Newfoundland and in Alaska to as far south as the Great Lakes, the Red-breasted Merganser prefers the wooded lakes and tundra ponds. But during winter, this duck prefers the salt water and spending its time along the coasts from Alaska south to northern Mexico, as well as from Maritime Provinces south to Florida along the Gulf Coast. Mergansers eat mostly fish, crustaceans, tadpoles, and insects. When diving for their underwater prey, they like to herd the fish into the shallow water where they are easier to catch, which is one reason they prefer to hunt cooperatively. There are actually four different foraging methods the Red-breasted Merganser uses: Individual Search, Shallow Diving, Deep Diving, and Cooperative Herding. The two female mergansers we have been watching were using the Individual Search Method even though they were together. This method involves swimming continuously while searching for prey with their head submerged in the water. They foraged for long periods of time and would take small breaks to briefly look around, perhaps, to make sure there were no predators nearby. Eventually, one of the pair climbed out of the water to rest. 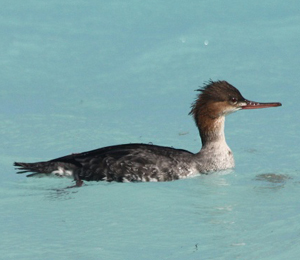 In North America, there are three species of mergansers who all have the same thing in common. They all have serrated bills which probably makes it much easier to hold on to their prey. These ducks have earned their nickname "Saw-bill." Two of the species that can be confused are the Red-breasted and Common Mergansers. Both of these are larger than the Hooded Mergansers. The bird watching was excellent this week at the Dry Tortugas. The weather was great all week and should continue to be so during the next week or two. Come out and join us for some of the best birding around, and don't forget to bring your binoculars and scopes.